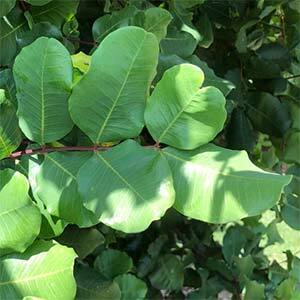 An attractive small tree, Ceratonia siliqua is commonly called the Carob tree, and it is the tree that produces the carob pods, or beans used as a chocolate substitute. 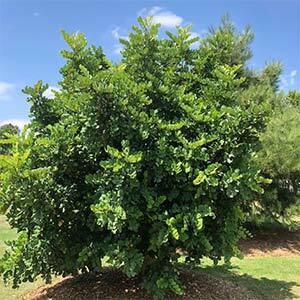 Being from the Mediterranean including areas in Turkey, these are a rough tolerant hardy tree. Characterised by dense foliage, it is deep brown pods that contain the pulp used to make carob that they are grown for commercially. The flowers are small, yellow in colour before turning to red, and appear in clusters held close to the stem. The actual fragrance of the flowers is unpleasant, so this is not a tree to grow close to a house or pathway. Foliage is best described as glossy, rounded and leathery. Older foliage is green, new foliage has a bronze tinge to it. best grown in full sun and in a well drained soil. Soils that are very acidic, or constantly boggy are not suitable. 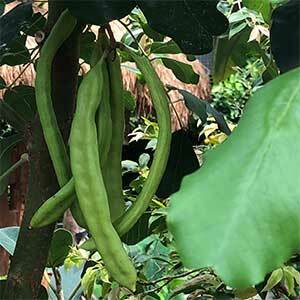 Best grown in a slightly sheltered position, and although the tree is regarded as drought tolerant, if you are growing it for the pods, some extra water will be required. If you are growing the tree for the pods, it is best pruned each year to maintain a bushy growth habit and increase productivity. You will need a male and a female tree to get pollination for pod production. Usually from seeds. Seeds will need to be scarified before planting to improve the germination rates. One method is to soak them for a day before planting. Height – will reach 10 metres (30ft) plus often shorter. Spread – Will form a crown to around 4 metres plus. Flowers – Yellow turning to red. Root system – Very deep. Frost tolerant – Yes, however flowers and therefore seed production will be limited by frosts. Drought tolerant – Yes, watering will increase productivity.